Constance Cooks is a web show about a web cooking show. This is a project that is near and dear to me; it's about food AND it includes a cast and crew of people I truly adore. So it's a combo of food and Art. Themes that really, truly belong together. What I find even more impressive is that my thespian friends are not just doing a same-ol' basic Kickstarter or Seed & Spark campaign to raise money for their production. Nope! 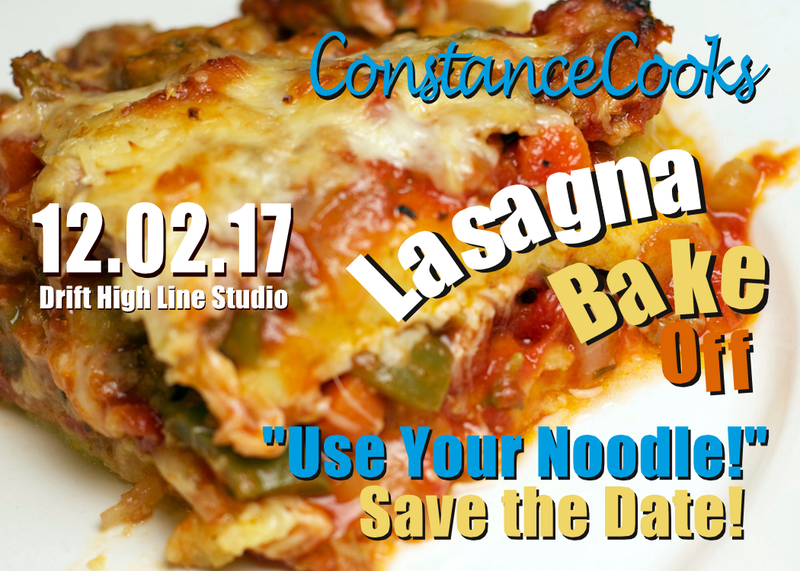 They are going right to the heart -rather, the stomach of the matter, by putting together a delicious Lasagna Bake Off! You can enter as a competitor, be a judge or.... be like me: a MASTER JUDGE - (which gets you some extra perks AND is a tax deductible contribution!). Tickets help support the Arts AND your feed your hunger all at once. The competition is being compared to the Lasagna Olympics. With Booze! Hello? What's not to love? P.S. I will also be interviewing the star of the show very soon for NYCFG... stay tuned and hungry my friends!